For novice Cloud developers, aspiring .NET / Cloud architects, and all other IT professionals associated with the .NET Core framework & Cloud computing, especially with Microsoft Azure, this tutorial will explain the importance and capabilities of newly released .NET Core 2.0 framework. .NET Core 2.0 is all about making things easier. It just made simpler to get started with developing web apps along with building great rich UI. Razor pages are one of its newly introduced feature. Razor pages works with .NET Core 2.0 or higher and are only supported by Visual Studio 2017 v 15.3 or later only. For creating a web app, we need Microsoft Azure Account. If you don’t have one, create your free trial account by clicking here. Visual Studio 2017 v15.3 (as of writing, it’s in preview). Download Visual Studio 2017 v15.3. Open Microsoft Visual Studio and select Web => ASP.NET Core Web Application. Give some valid name for the application. Here we have given application name as, ‘WebMVCCore2’. Click OK to move ahead with next template selection screen. For creating MVC application, select ‘Web Application (MVC) template. This template will create sample ASP.NET Core 2.0 MVC views and controllers. Make sure, you select ’ASP.NET 2.0’ from dropdown available to choose framework. Though if you choses any lower version, this newly added application, frameworks templates options would no longer be available. For keeping this article simpler, let the authentication as ‘No Authentication, with ‘Enable Docker Support’ checkbox, unchecked. Once done with selecting framework and template, click OK. This will create an ASP.NET Core MVC web application with sample Views & controllers code. In Solution Explorer, right click on Project => select Edit .csproj option. Notice it has only one package, with one version! We don’t need any other packages. This single package bring in all of ASP.NET Core into this application. Yes, you can even add Web API controllers, build powerful APIs, in this application and it will run perfectly fine. 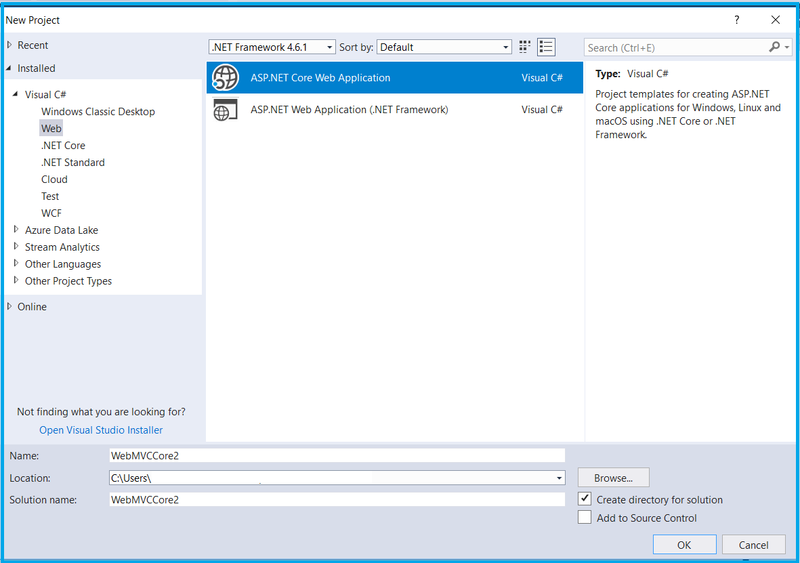 Now let’s deploy this ASP.Net Core MVC web application to Microsoft public Cloud i.e. Microsoft Azure Web Apps. There are multiple ways of deploying Core MVC web application to Azure web apps, like, through Azure web portal, Azure CLI and Repository Stacks, provided to programmers of ASP.NET. Along with this listed items, we can also deploy application using Visual Studio. Clicking on, ‘Publish’ will open up below window. We will be using ‘Web Deploy’ deployment method. As we are pushing this application for the first time, Select ‘Microsoft Azure App Service’, selecting ‘Create New’ option and click ‘Publish’ as highlighted below. Now, this part is the most important one in this entire process. 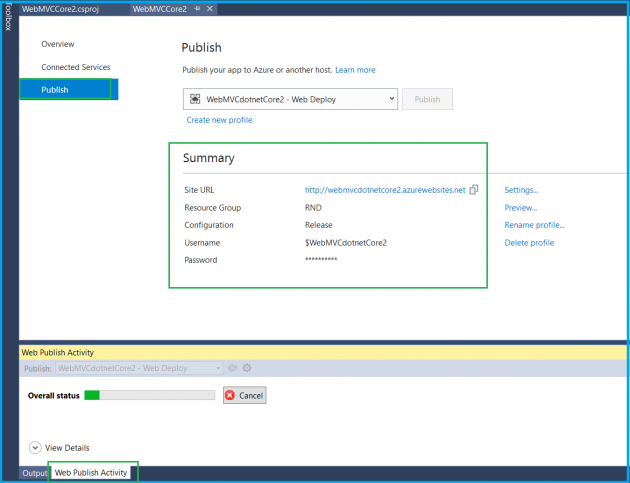 Here, we will be creating new Azure Web App for deploying ASP.NET Core MVC web application. Subscription – Your Azure subscription. 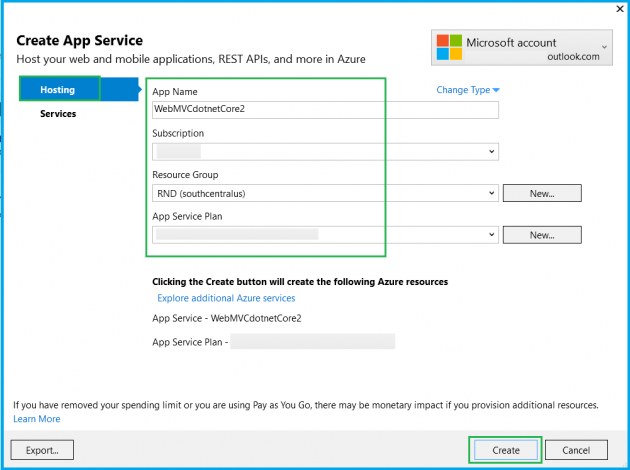 App Service Plan- You can select an existing App Service Plan or create new. Tab name ‘Services’, recommends with other related Azure services may require for application, like SQL Database. In this tutorial, we are not using any Database. Enter the details and click ‘Create’. This will create an Azure Web App with the submitted details. This could take several seconds to get on to the next screen. This screen mentions important though few details of Azure web app. 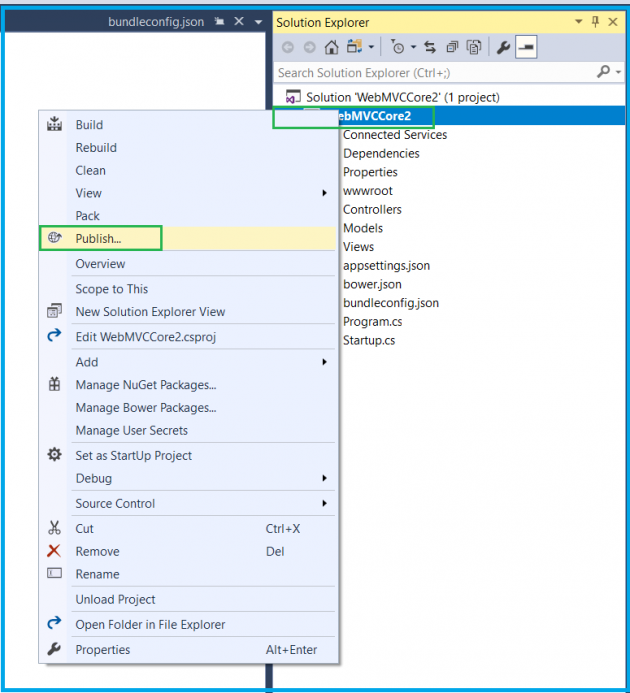 ‘WebMVCdotnetcore2 – Web Deploy’, application name with deployment method selected. Preview files details being modified. This usually come in picture during next round of deployment. Once publishing succeeds, it will open the browser with our web application running. Great! Our ASP.NET Core 2.0 MVC Web application is now live on Azure Cloud! Notice the Web URL, as mentioned above. Click on ‘App Services’ option. We can see our newly created Web App been listed. Now, let’s modify our application. With interest to our article, will make small text changes in ‘HomesControllers.cs’, as shown below. So as once redeployed, we can notice this change made. Now the only thing that we need to do is, Click on ‘Publish’ button. Once publish succeeds, it will open the browser with our web application running with changes being made, Check below image, updated text is now live! 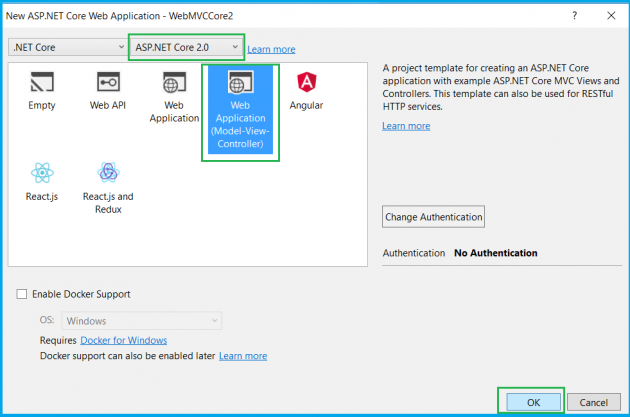 With ease, we created ASP.NET Core 2.0 MVC web application and deployed it to Azure Web Apps using Visual Studio 2017 v15.3. Also, modifying the application and re-deploying it to Azure was accomplished in minimal efforts. Johnny is a technical writer with more than 6 years of experience. I write articles especially for Java, Python and Asp.Net. Currently I work for TrustedHints and I have also got well response to write articles on CRM, Hadoop and QA.